Local Councils traditionally provide payment collection services using over the counter methods which can be costly and time consuming. Many councils such as Aberdeen City Council are now looking to developing their service by offering self-service facilities for a range of Council payments. To provide a simple to use solution for customers who are used to a face to face service. Provide a platform to increase payment methods for a wide range of services including school payments. Provide a substantial cost saving. In December 2012 Aberdeen City Council conducted an internal audit to review the processes within their Customer Service Centre. The scope of the audit was to consider the key processes, Council Tax, Benefits and Parking Permits along with the supplementary review of Floorwalkers in the Main Reception. By interviewing staff and customers and reviewing policies and procedures the team were able to identify areas within the service requiring improvement that would also help resolve issues, such as queues at the main reception, creating additional pressure for advisers and reception staff. reduce the cost of transactions. Aberdeen City Council hoped that staff input would be reduced by 0.74 FTE (a reduction of 16,500 transactions handled by Tier 2 Customer Service Advisers). The actual input was reduced by 1.32 FTE which exceeded the council’s anticipated benefit by 56%. The payment kiosks have also had a positive impact on the average queue times for non-payment transactions, reducing overall queue times by one third (31%). This has enabled Customer Service Advisers to devote more time to deal with complicated enquiries such as Council Tax and Benefits without large queues forming. It was hoped that the kiosk would lead to a reduction in the number of customers using PayPoint and Post Office to make payments to the council. The council previously paid to up to 46.49 pence for each transaction using these payment methods. PayPoint transactions were reduced by 5% in the first eight months, saving up to £4475 per annum. The kiosk payments also make the payment to the landlord or council tax account the next working day, rather than the three working days provided by PayPoint. This can lead to increased customer satisfaction as they are not affected by payment delays. One key issue for the Customer Service staff was the handling of high volume of cash and therefore the associated security risks. The council specified the kiosks were to provide a 74% reduction in cash handled by Customer Service Advisers. Since the kiosks where installed the council seen a reduction of 97% in the amount of cash handled and with this a reduction in the associated risks to health and safety and an increase in staff morale. With the installation of the kiosks the council has seen a 13% overall increase in cash transactions at the Customer Service Centre. This indicates that customers are being attracted to Marischal College Customer Service Centre in order to make a payment. The Council Tax collection rates have also been monitored by the council and see an increase of 35% in transactions and 13% in the value of the transactions. One area of concern for the council was the number of complaints about the lack of facility to pay cash for Council Tax or rent. Feedback from Customer Service teams confirmed a 100% in reduction complaints from customers wishing to pay rent and Council Tax in cash. One of the requirements for the kiosks was to increase customer satisfaction. 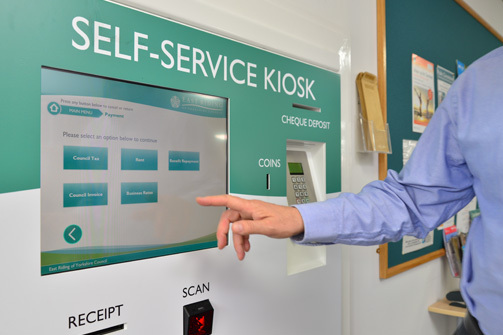 As part of the initial study a survey was carried out, the results showed that 42% would never use a self-service kiosk and 93% were satisfied with length of wait time. 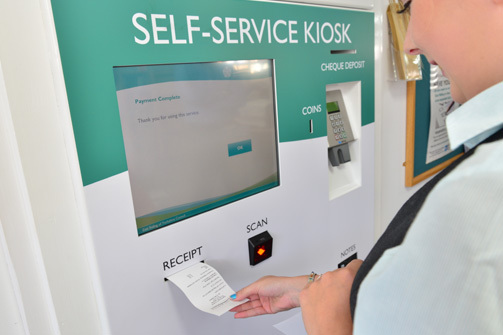 Following the first six months since the installation of the kiosks, 68% of customers had used the kiosk and 98% were satisfied with the length of wait time (an increase in 5%). Over nine out of ten customers surveyed also stated that the payment kiosk were a ‘convenient’ or ‘very convenient’ way of making a payment. Nine out of ten customers also found the kiosks ‘easy’ or ‘very easy’ to use and 92% of customers would use the kiosks again. The installation of payment kiosks at Marischal College Customer Service Centre has been a success, with the vast majority of the project benefits being realised.